Whether you are a resident or a holidaymaker, our advertisers may well have something to interest you. 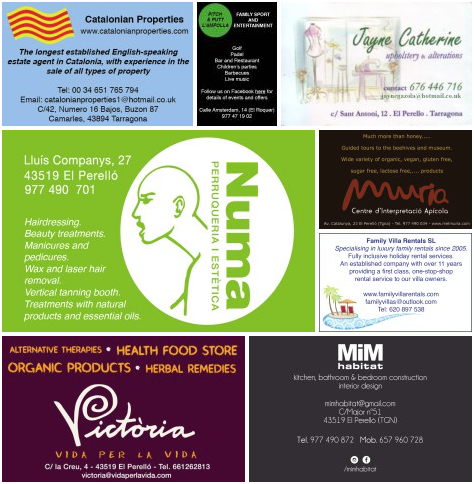 We think our advertisers offer some of the best services in and around El Perelló, L’Ametlla and L’Ampolla. Pitch & Putt L’Ampolla: golf and many more activities are available at the refreshed club – there’s a bar and restaurant, parties and live music – all with a focus on family sport and entertainment. Jayne Catherine: Perelló-based sewing machine whizz who offers upholstery and alterations. Victoria Vida Per La Vida: a beautiful health food store in the heart of old El Perelló with organic products and alternative therapies available. Numa: hairdressing and beauty treatments with natural products and essential oils. Catalonian Properties: a well-established English-speaking estate agent. Mel Muria: there’s much more than honey here, including guided tours of the beehives and museum (in English, French, German, Spanish and Catalan) and a wide range of organic and specialist produce in the shop. MiM Habitat: offering stylish kitchen, bedroom and bathroom construction and interior design. Family Villa Rentals: take a holiday in one of their luxury family villas, or – if you are a villa owner – hand your villa over to their professional team to manage. Thank you very much to our advertisers for their support. Check out our Business Directory here. Find out more about advertising with Perelló Plus here. Disclaimer: Each individual advertiser is solely responsible for the content of its advertising material. We accept no responsibility for the content of advertising material, including, without limitation, any error, omission or inaccuracy therein.